Home > Heavy Duty V Belts > Poly-V Ribbed (Micro -V) Belts > J, PJ Section Poly-V (Micro V) Belts - 3/32" Rib Width. > 350J6 Poly-V Belt (Consumer brand), Metric 6-PJ889 Motor Belt. > 350J6 Poly-V Belt, Industrial Grade Metric 6-PJ889 Motor Belt. 350J6 Poly-V Belt. Consumer Brand. 35” Length. 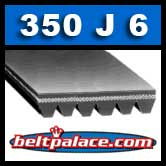 PJ889/350J 6-Rib drive belt replaces fitness belts, compressor belts, drive belts, and electric motor belts. 350J-6 Micro-V Belt. 352J6 Poly-V Belt, Metric 6-PJ895 Motor Belt. 352J6 Belt (265-369) INDUSTRIAL GRADE 35.25” Length. J Section Motor Belt replaces fitness belts, compressor belts, drive belts, and electric motor belts. PJ895/352J, 6 Rib Poly-V Belt.